holy crap, that was such an incredible fashion week here in nyc! but now that it’s over, i can finally get back to sharing more details about my africa trip! and even though it’s valentine’s day…i won’t be doing a post with pizza, chocolate, and an excessive amount of heart balloons becauseeeee #single. i left off on my africa trip with the first two posts from the safari in botswana: one sharing all of the details and the second being a photo diary of the safari! in the first post, i briefly mentioned details about our journey to the next stop on our african adventure, victoria falls in zimbabwe, and how it involved an hour and a half flight on a tiny propeller plane right to the border of zimbabwe, and then we had an almost 2 hour drive across the border to victoria falls. it was a lot. 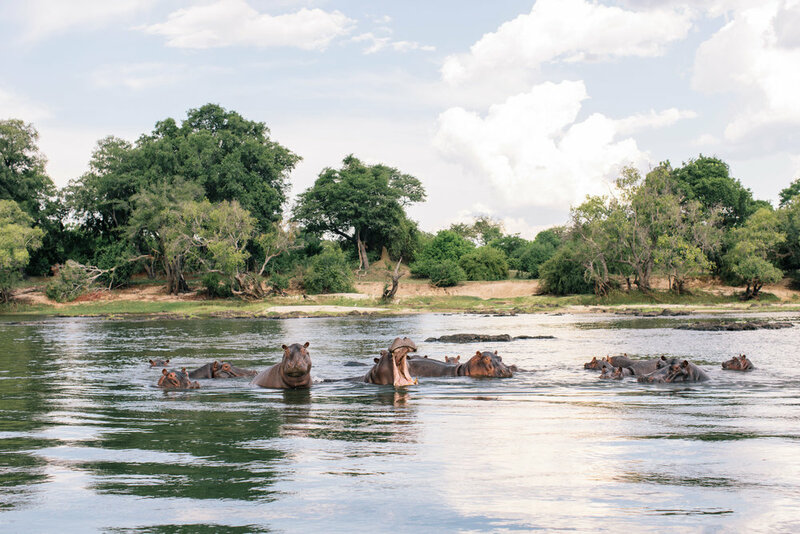 oh yeah, and once we got to the national park where our hotel was, we then had to take a 20 minute boat ride on the zambezi river to get to the actual hotel. but once i was able to sit on the couch in the lobby and get the wifi password, i was very happy. as stunning as this hotel was, we only stayed one full day (two nights) because the main event was victoria falls itself. after our first night of a sunset cruise and dinner in the lodge, we got up and drove over to the falls for a walking tour. we got there at about 9:30am with a guide from the hotel and began the tour of victoria falls and it was already scorching hot at that point. victoria falls is one of the largest waterfalls in the world and we were lucky enough to go during their dry season so we could actually see the falls and the rocks behind it. during the rainy season, the mist from the falls is so heavy that you really can’t see anything at all. for those familiar with niagra falls, it’s a pretty similar setup where one side belongs to zambia and the other (with the good view) belongs to zimbabwe. we did see people on the zambia side who were sitting in the “devil’s pool” (the part just before the drop off of the waterfall where it’s “safe”) but you couldn’t have paid me enough money to partake in that. one thing i did want to do, though, was a helicopter ride. so after our lunch at the victoria falls hotel, my dad and i got picked up and were driven to the helipad. it was an incredible, and slightly nerve-racking, experience the resulted in my favorite photo from victoria falls! all in all, the flight was about 15 minutes and we were back on the ground before we knew it. i would strongly recommend that anyone visiting victoria falls look into doing a helicopter tour. as beautiful as the falls were from the ground, there was no comparison to the view from above! in terms of photos for zimbabwe, i really didn’t take many. i brought no photographable outfits for this portion of the trip because i knew it was going to be all exercise and more 110 degree heat. but of course i did snap a few scenic photos and put my tripod to good use for a long exposure of the stars! for the long exposure photo, i set up my camera on the tripod and just cranked my iso up to 10,000. i did a few test shots and after a few test shots, the winning image had the settings of iso 2000, f/9.0, with a shutter speed of 30 seconds…and to get the light on the leaves, i just used my iphone flash light for about 4 seconds of the exposure. if i was to do it again, i would probably switch up the settings a bit and have a sturdier tripod but the bugs were starting to get to me haha! i was so happy we stopped at victoria falls while in africa but there is no reason to stay there more than one or two nights. next post is all about cape town so stay tuned!